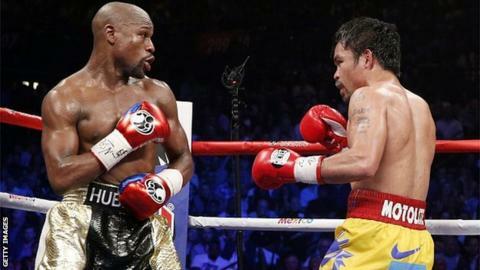 Floyd Mayweather says he will not fight Manny Pacquiao again after branding the Filipino a "coward" and a "sore loser". Mayweather took his unbeaten record to 48-0 in Las Vegas with a unanimous points victory over Pacquiao last week. Pacquiao, 36, claimed his performance was restricted by a shoulder injury, but Mayweather dismissed the explanation as an "excuse". "He lost," said the American, 38. "He knows he lost. I lost a lot of respect for him after all of this." Mayweather says he did not detect any physical problem for Pacquiao during their welterweight contest. Revenue: Estimated $400m (£265m) in total. Boxers: Mayweather and Pacquiao split about $230m (£150m). "Absolutely not," Mayweather said in an interview with Showtime, to be shown this weekend. "He was fast. His left hand was fast, his right hand was fast and he was throwing them both fast and strong." Pacquiao is being sued for allegedly failing to declare his injury before the fight against Mayweather at the MGM Grand. He had surgery to repair a torn rotator cuff on Wednesday and would not be able to face Mayweather again for around a year. Mayweather told ESPN earlier this week he would consider fighting Pacquiao again but backtracked on that in the Showtime interview. "I change my mind," he said. "At this particular time, no, because he's a sore loser and he's a coward. If you lost, accept the loss." Mayweather says his last fight before retirement will be in September, with Britain's Amir Khan a possible opponent.